Angry Birds - possibly the most popular mobile game ever made. Over the few years the game has been available, it's like there hasn't been a single day without Angry Birds in the news. Rovio Mobile, the developer of the game, has made sure that the Angry Birds mania grows to tremendous proportions by now only working on improving the game, but also through merchandizing and clever marketing. A bright example is the recent news story that Formula 1 driver Heikki Kovalainen is going to race with an Angry Birds-themed helmet. Realizing that it has a money-making machine on its hands, following the launch of the original game, Rovio was dedicated to producing mostly more-of-the-same type of sequels of the game, with Angry Birds Seasons and Angry Birds Rio. While these newer games were pretty good as well, having that familiar cute cartoonish style, and the same addicting gameplay, Seasons and Rio didn't bring almost any new features to the series. The main idea of the game remained largely the same, which made some of us question Rovio's ability to design a different game (be it in the Angry Birds universe or not) with the same success. When Angry Birds Space, the latest iteration of the franchise, got announced last month, we secretly started hoping for a change. Well, now that Angry Birds Space is finally here (available on iOS, Android, PC and Mac), and we've played through 30-something of its levels, we can safely say that Rovio has indeed recognized the need for some fresh air. 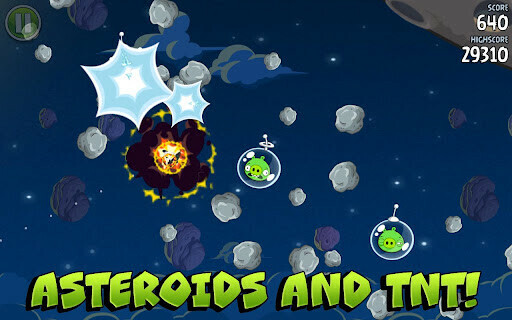 As a result, Angry Birds Space is the first real departure from the gameplay mechanics that we've seen employed in the previous versions of the game. 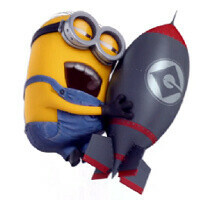 But why have the angry birds taken the fight to space, anyway? Here's how the story goes: We find our familiar birds living peacefully on Earth, taking care of their beloved eggs. However, in a single moment of intergalactic significance, a space portal opens in the sky, and a new type ice bird comes through, carrying a golden egg. Soon after the ice bird lands on Earth, though, a mechanical hand of evil pig spaceship follows it through the space portal and grabs the golden egg, along with the normal eggs of our birds. Upon realizing that their eggs are gone, our feathery friends simply get onto that slingshot of theirs and launch through the space portal in the sky, and after the evil pigs. That pretty much sums up the main story line of Angry Birds Space. Probably not good enough for a feature-length film, but certainly deep enough for a successful mobile puzzle game. The main difference in gameplay stems from the fact that the never-ending fight between birds and pigs has now been taken to outer space, where different physical rules apply. So, what's so different about Angry Birds Space? The main difference in gameplay stems from the fact that the never-ending fight between birds and pigs has now been taken to outer space, where different physical rules apply. As you know from previous Angry Birds games, the game is played by launching your birds at the pigs that have barricaded themselves at the opposite end of the screen. In order to hit the pigs successfully, though, you have to take into consideration the trajectory that your launched bird is going to have, due to Earth's gravity. Well, as you know, there's no gravity in outer space (actually, gravity is present everywhere, but it's so weak in outer space that it's like there isn't gravity at all), which makes a world of difference when playing Angry Birds Space. But hey, that doesn't mean that you'll be happily launching them birds at the nasty piggies standing right in front of you. No, no. 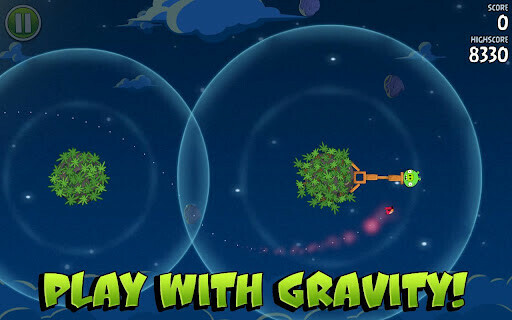 According to Rovio, outer space is actually a pretty dense place, full of all kinds of debris (destroyable, in most cases) and small planetary objects, which have their own gravitational fields, altering the trajectory of your flying birds. In some levels, there's no gravity at all, but those levels are usually full of other obstacles that you have to dodge in order to get to the piggies. In other levels, though, a part of the area is gravity-free, but there are some large space objects that have their own gravitational fields that you have to use to your own advantage, in order to overcome the difficulties of the terrain. Additionally, on some levels you can trigger space portals that take you to bonus levels where you can collect some more points. The types of birds that you have at your disposal are pretty similar to those in the previous games, though there are some differences here as well, including in the way you'll be using them. 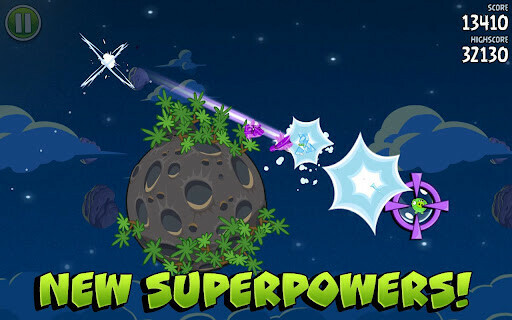 Overall, we are extremely happy about the new gameplay mechanics and features, as they ultimately make Angry Birds Space feel both familiar and very different at the same time. 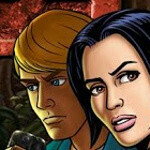 The visual style of the game has remained pretty much the same, which is a good thing, having in mind that the cute, polished characters played a major role in the success story of the game. What can we say? Birds and piggies are as round as ever, and everything else is just as polished and cute. The new space environments add to the astro-flavor of the game as well. The same goes for the sound and music of the game. Different sound effects - the same great atmosphere that we've come to love from previous Angry Birds games. Sure, it would have been nice to see something really different and fresh in terms of graphics in Angry Birds Space, but such bold deviations from the original concept of the game must be very hard to undertake. 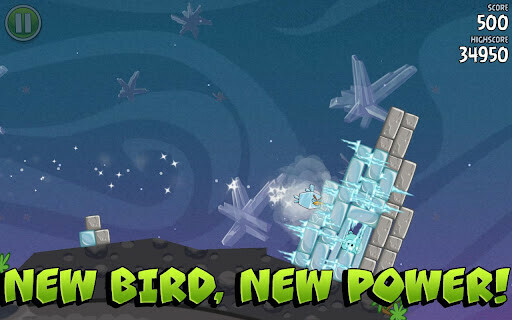 After all, the game is still very cute, and the new environments, as we said, create a brand new Angry Birds experience. 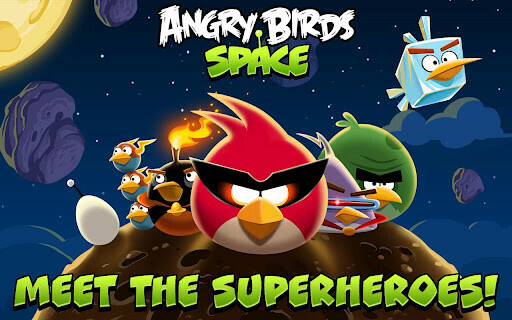 At $0.99 for iPhone ($2.99 for iPad) and free for Android, Angry Birds Space is a game that you simply have to play, no matter if you've been part of the Angry Birds mania until now or not. 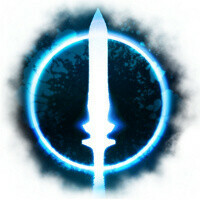 The game is easier to pick up than ever, due to the lower difficulty of the first levels, though even more experienced players will have their challenge in the later acts. Right now, with Angry Birds Space you get three main acts, with a promised fourth one coming soon. We actually managed to play through the first 30 levels in under an hour, but found ourselves stuck on the very first levels of part two. Angry Birds may soon find itself dangerously close to becoming a game that shouldn't be distributed through app stores. It should come preloaded on every device. 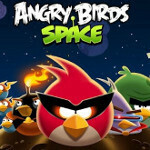 We're glad that Rovio finally shook things up a bit with Angry Birds Space. It's safe to say that this is the most entertaining and engaging Angry Birds ever. If the company keeps on developing the series with this level of success, Angry Birds may soon find itself dangerously close to becoming a game that shouldn't be distributed through app stores. It should come preloaded on every device. Now go catch those bad piggies! Check out more Angry Birds Space screenshots in the gallery below! playing on my G Note. Thanks Rovio. Yes thanks to Google and Android for this being FREE. Screw Apple. Now that's not a very nice thing to say, isn't baaaaa-haaaa-aaaaad enough they have to pay .99¢ plus iTax for this great new version? Shouldn't you say screw Rovio? They choose how much apps cost. No, if you hate Apple you must blame them for everything. I think the only reason why AB isn't free on the iPhone is because they just get so much money from it. With the free version, they get even more from the ads. Since android phones (for the most part) have larger screens, using ads doesn't disrupt the gaming experience. I play it on my GS2. There are no ads. 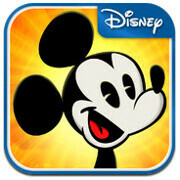 just downloaded .. its awsome! People STILL play Angry Birds? I thought that fad ran out in 2010? 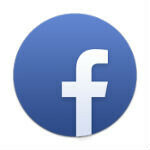 they also have a paid (99¢) version for android. Much better without the adds. Wish all the AB games had a add free version. Another great release to the angry birds series. Rocking it on my galaxy nexus. Just downloaded it best of all its free like all the other angry birds games! Great game, I'm more into this one than the previous ones! mynightmarefr13 the best app ever~!